Fig. 1: Measuring the power of a light bulb with multimeters. The measuring of the power consumption of a device or the dissipated power of a component is often a source of errors. Very decisive for the result is if the measurement is done on a direct or alternating current and how the voltage and current shapes look. Also the type of load, which measurement equipment is used and how the measurement results are processed will dictate the accuracy. When the power is measured it's necessarily that both the voltage and current are measured at the same time, and that the relationship between these two is taken into account. 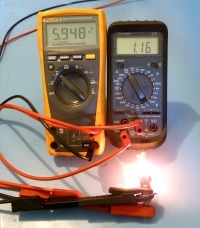 The ways the voltage and current are measured have a great influence on the accuracy. See the articles Voltage and Current for more information about correct measuring these parameters. This equation is valid on all circumstances. A proper wattmeter measures the power accordance this equation. More detailed information about this in the article Theory & Definitions. More often the power will be measured with separate volt and ampere meters. In this case one has to be alert to prevent measurement errors. The shape of the voltage and current and their relation is very determinative in this situation. Fig. 2: Power from a pure direct voltage and current. If measured on a pure DC voltage and current, there are no problems to be expected. The measured mean voltage and current values can simply be multiplied to become the average power. The voltage and current in figure 2 have a continues value and they hold no ripple or noise. In this example the voltage is 13 V and the current is 7 A. The power is therefore: 13 V·7 A = 91 W.
Fig. 3: Power from a pure DC-voltage and an impulse shaped current. Even if the direct current isn't ideal, it's still allowed becoming the power from individual mean voltage and current measurements. The current in figure 3 has an impulse shape. The average value can be determinate with an amperemeter in the DC-range and is in this example 0.5 A. It doesn't matter if the current becomes periodically negative. In this case the voltage must be very pure and may not contain any ripple or noise. The voltage in this example is 13 V and the power is therefore: 13 V·0.5 A = 6.5 W.
In practice the opposite can occur: The current has a pure shape and the voltage includes ripple. Also in this case the measurement is valid. Fig. 4: Power from a DC-voltage with ripple and an impulse shaped current. If the DC-voltage as well as the DC-current aren't ripple and noiseless than its impossible to measure the power from individual instrument average readings. The mean voltage in this example is 10 V and the mean current is 2 A. A simple multiplication would lead to a power of 26 W, while the real power is 25.1 W. Thus, where both waveforms are pulsed, have ripple or contain noise, the power can only be measured with a wattmeter or digital oscilloscope. When measuring the alternating voltage power the load type becomes very decisive for the validity of the measurement. In some cases the AC-power can be measured with an individual AC volt and ampere meter. But in most situations the power can only reliable being measured with a wattmeter. Fig. 5: AC-power from a sine voltage with an ohmic load. Even if the voltage and current shape is deviant from a pure sine wave the power can be measured in this way. Condition for this is that both instruments measure the real RMS-value, and one is convincing that the load is pure ohmic. In figure 5 the effective voltage is 8 V and the current 6 A. The power is therefore 8 V·6 A = 48 W.
Fig. 6: AC-power from a sine wave and reactive load. The shape of the voltage and current has to be a pure sine wave otherwise no valid phase measurement can be done. The measured values in figure 6 of the voltage is 8 V and the current is 6 A. The lag of the voltage in relation to the current is 50° (cosφ = 0,643). The calculated power is than: 8 V·6 A·0,643 = 30,86 W.
Fig. 7: AC-power from a non-linear load. The waveforms of the voltage and current will never have the same shape if there is a non-linear load. The power can therefore never be measured with individual volt and ampere meters. Only a wattmeter or DSO can measure the real power. Would the power be determinate by individual instruments, (V = 8 V and I = 4,44 A), than the resulted power would be 35,5 W. The real power in this example is 32,6 W however. Apparent powers may never be added together to calculate the total apparent power. The total apparent power must always be measured. To calculate this reactive power an additional phase measurement has to be carried out. The reactive power applies only to pure sine shaped voltages and currents. The measurement is not valid if there is a not-linear load. In the foregoing, the terms "ohmic" and "reactive" are mentioned in relation to the restricted validation of measurements. One should be aware that few devices meet this precondition. For example, a coil or transformer can not always be considered as clean reactive components due to the magnetic hysteresis of the core. Electronic devices like television sets or computers draw usually impulse shaped currents, which is far from sinusoidal. For very precise measurements even a light bulb can't be seen as a pure ohmic load. Due to the pulsating power dissipating following the alternating voltage, the resistance value alters slightly two times per period. This to emphasize that the power in most cases can't be measured with individual volt and ammeters and real wattmeters must be used. Fig. 8: Power measurement with a volt and ampere meter. Figure 8 shows a widely used measuring arrangement with an individual volt and amperemeter. The applications are very restricted as explained in the previous chapter. In general this configuration is conveniently applied for DC, because the voltages will normally be reasonable constant. If this arrangement is used for AC applications and the voltage and current shapes are not sinusoidal, than the instruments must measure the true RMS values. Fig. 9: Power measurement with a wattmeter. A wattmeter has four terminals, two for the voltage and two for the current. Figure 9 shows how a wattmeter must be connected to the circuit. An electro-mechanical as well as an electronic wattmeter measures always the dissipated power. By the construction of it, or electro-mechanical, or electronic or by software, the meter calculates the mean value from the products of the instantaneous value of the voltage and current. It is recommended to check if the wattmeter really measures by this principle. And not all wattmeters are suitable for AC and DC applications; this also has to be checked beforehand. Also energy meters (kWh) like those used in houses, or the separate units, can be used for power measurements. Often these meters measure only the amount of energy and not the power. In case the power must be known, the measured energy can be divided by the measure time. A digital oscilloscope (DSO) can perform very reliable power measurements. It's therefore necessarily that the scope is able to do mathematical functions on the signals. Fig. 10: Power measurement with an oscilloscope and shunt resistor. The probe for the voltage measurement is connected directly to the load. The current is measured indirectly via a shunt resistor. Because the grounds of both scope channels are internally connected, the ground terminals of the probes must be connected to the same potential. Because of this the current is measured with inverted polarity. It's therefore necessary to invert the signal coming from the shunt. By multiplying the voltage and current signal a third signal is created that represents the power as function of time. To take the average of this power signal over one full period the average power is determinate. Fig. 11: Power measurement with an oscilloscope and current probe. The principle of the power measurement is the same as describes above. The benefit of using a current probe is that the current tab is electrical isolated from the voltage measurement. The current can now being measured with the correct polarity. For the measurement of DC-currents or where the AC-current is asymmetrical, a DC current probe must be used. It is very important to keep in mind that the voltage and current measurements influence each other. Therefore the placement of the volt and ammeter must be considered carefully. For clarity individual volt and ampere meters are shown. Fig. 12: Power measurement arrangement: amperemeter ahead voltmeter. An amperemeter has a certain impedance that is placed in series with the power line. This causes an extra voltage drop. When a voltmeter isn't placed direct to the place where the power must be measured, the voltage drop across the ammeter will be included into the measurement. It's therefore recommended connecting the voltmeter directly to the object. The extra current to the amperemeter is in most cases negligible as most voltmeters have a very high impedance and the current through the voltmeter is extremely low. Although, at very low currents or at high frequencies, the voltmeter current can become relative high that it's no longer negligible. Fig. 13: Power measurement arrangement: voltmeter ahead amperemeter. Figure 12 & 13 shows two different connection options. The amperemeter in figure 12 measures the current though the load as well as the current through the voltmeter. This is equal to the current supplied by the power source. The voltmeter reads the voltage across the load. This voltage is equal to the source voltage minus the voltage drop across the ammeter. The arrangement in figure 13 measures only the current to the load and not the current supplied by the source. The voltmeter measures the voltage across the source. And in this case the load voltage isn't measured correctly. The goal is to choose the measurement arrangement that causes the smallest measurement errors. The source voltage, current and meter impedance has all influence on the accuracy. Wattmeter's can easily be overloaded even when the measured power is small. The chance becomes significant when impulse voltages and currents are measured or when they have large phase differences. By this there is also a change that one selects a too sensitive range which can cause overdriven inputs. Fig. 14: Dissipated power measurement of an inductor with a digital oscilloscope. The image above gives an example of such a situation: The calculated product of the voltage and current gives a top value of 172 mW while the average dissipated power is only 26.7 mW. The chance of overdriving is now considerable. It's therefore important to have overload indicators for voltage, current and power on a wattmeter. The coils in electro-mechanical instruments can burn or breakdown. And coils can saturate which gives rise to errors. In electronic wattmeter's is clipping of the voltage or current input the most important reason of errors.